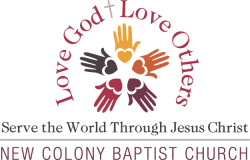 The music and worship ministry of New Colony Church seeks to glorify God and encourage those who worship with us. Through the use of drama, traditional hymns, contemporary worship bands, and choirs for all ages, our prayer is that those who believe will be strengthened in their faith, and those who are seeking will grow in their understanding of the character and grace of God, made known to us in Jesus, the Christ. For those who love to worship through music, consider joining the Choir Ministry Team (Adult Choir). We meet each Wednesday from 7:45 to 9:00 p.m. for rehearsal, and sing each Sunday during the worship service. Choir Ministry team is open to high schoolers and above and is a non-auditioning group. The Worship Team is comprised of youth and adults who are musically gifted (vocals, percussion, guitar, bass guitar, keyboard) and who are actively growing in their faith. This group is by invitation only. The Worship Team leads in musical worship each Sunday morning during our worship service. Preschool Choir for 4 and 5-year-olds is offered for several weeks each year. Children’s Choirs typically prepare musicals and/or musical dramas each year. Youth Ensembles meet occasionally to prepare musicals or songs for worship. Often NCBC youth who are musically gifted assist in leading preschool and children’s music activities.